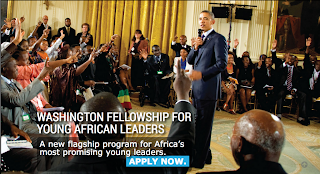 Young African Leaders Initiative (YALI) West Africa Emerging Leaders Program. Apply Now! The Young African Leaders Initiative (YALI) was launched by the United States government as a signature effort to invest in the next generation of African leaders. YALI promotes three models designed to identify and empower young leaders: the YALI Mandela Washington Fellowship (YMWF), YALI Network (YN) and now the establishment of Regional Leadership Centers across Africa. The YALI Emerging Leaders Program is an innovative and game changing leadership training program in Africa. The program is hosted by Ghana Institute of Management and Public Administration (GIMPA), and the first cohort walked through the doors on the 31st July 2014. YALI Regional Leadership Center (RLC) in West Africa – Accra invites applications for the 6th cohort of its Emerging Leaders Program 2018. Participants are taken through various forms of leadership training to prepare them for leadership roles in their various endeavors. At the end, participants are awarded with certificates and become members of the Yali Alumni. Teaches modern leadership broken down into four phases – a 5 week coursework phase delivered in-person or online and the remaining 12 weeks distributed equally among a mentorship program, internship or community service, and a report writing period. To apply, simply visit the Applicant Login page on the official website. New Applicants can click on the "Sign Up" link to get started. Existing Applicants are required to enter their already registered email address and password to login. Please visit Applicant Login to commence. The need to invest in grooming strong, results-oriented African leaders comes out of the statistics: nearly 1 in 3 Africans are between the ages of 10 and 24, and approximately 60% of Africa’s total population is below the age of 35.